You’re on top of your game. You’ve got the audience and this is not your first rodeo. You’ve got a big vision for the future but you know you won’t get there without support. Managing your online brand has become a bit too much for you to juggle. Being awesome is a full-time job and there are not enough hours in the day to oversee everything you’ve got going on. You don’t quite have access to cloning technology…yet…so you’re considering alternatives, however, you’re a bit controlling when it comes to delegating. Spend a weekend putting together your game plan and use this planner to help you stay focused and on track with the details of your hustle. 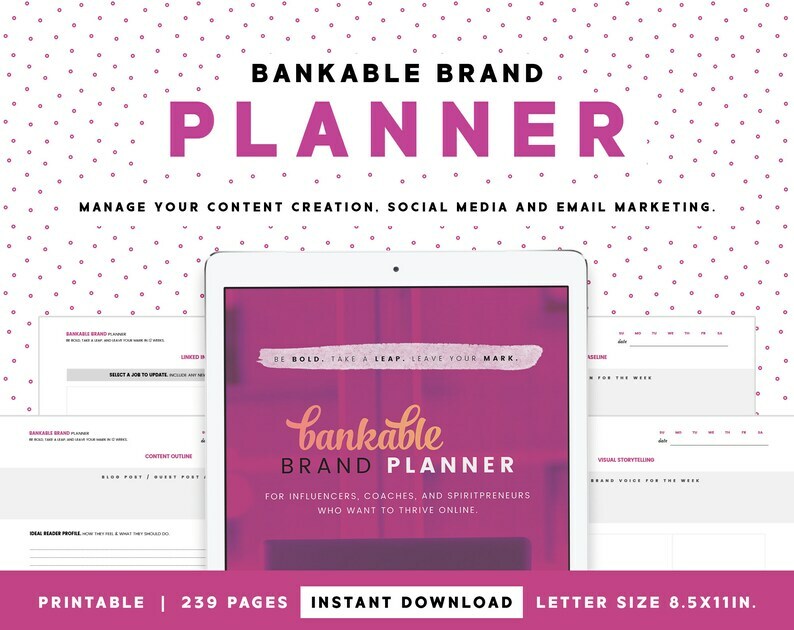 This planner is great for when you need structure with your social media strategy, email marketing, content creation, and big picture vision planning. Use this planner by your lonesome or get a bunch of your entrepreneurial tribe together and leverage this planner for your mastermind. The BANKABLE BRAND PLANNER covers 3 full months so that you can hone in on one big goal and put all of your sweat equity into making magic happen! This listing is for the INSTANT DIGITAL DOWNLOAD version of this planner. You will not receive a physical item with this purchase. If you would like to integrate this planner into your coaching practice, connect with me and we can discuss a collaboration. I'm down for creating alliances! However, distribution and resale of this digital download for commercial purposes is strictly prohibited. If you want to use them with your personal mastermind group, go for it but do not in anyway try to pass off the planner as your own.